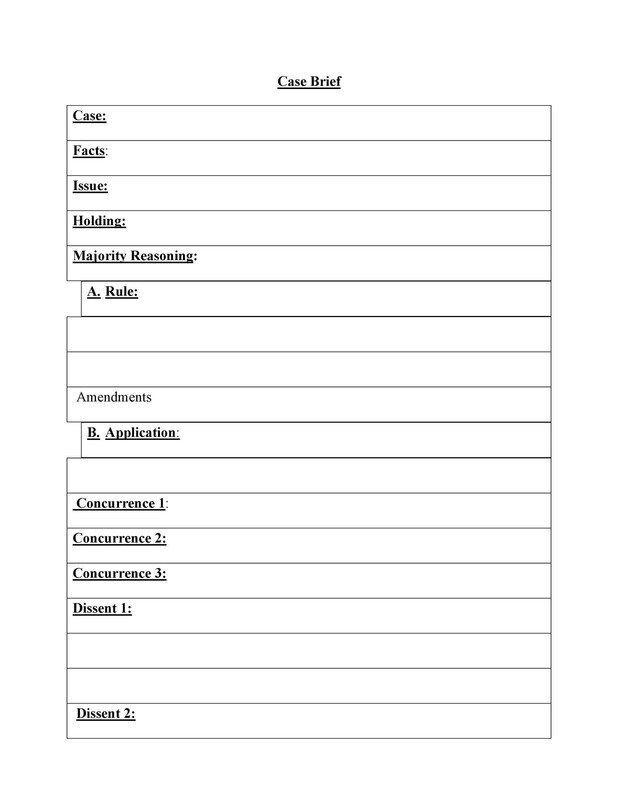 A case brief is a shortened, concise summary of a court opinion, usually in outline form. 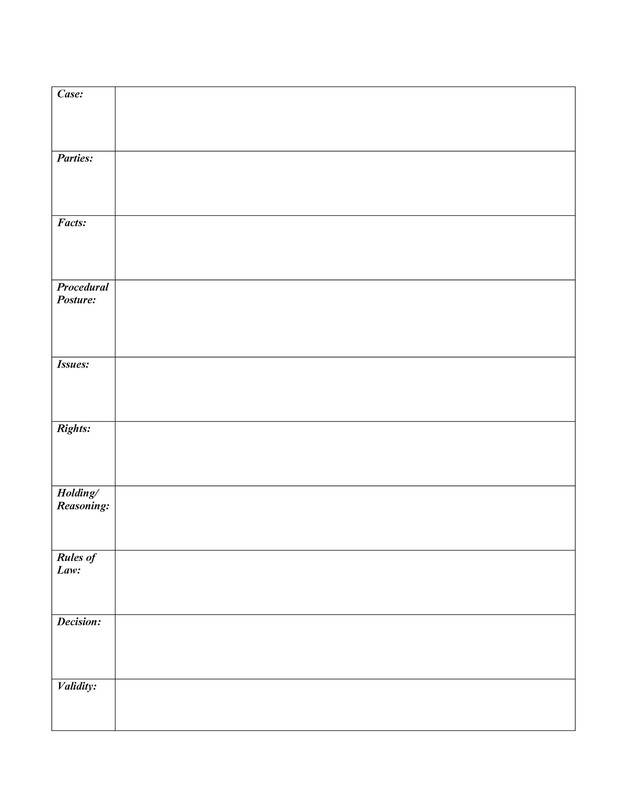 Hence the term “brief.” Typically this is used for more effective self-study. 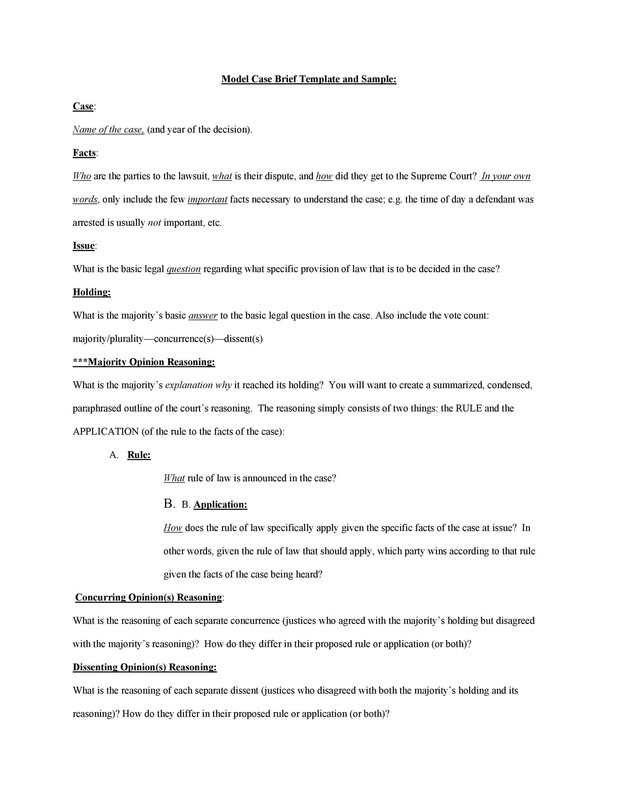 Obviously, it’s a lot easier to read a well-written case brief example rather than going through a verbatim case which is about 100 pages long. 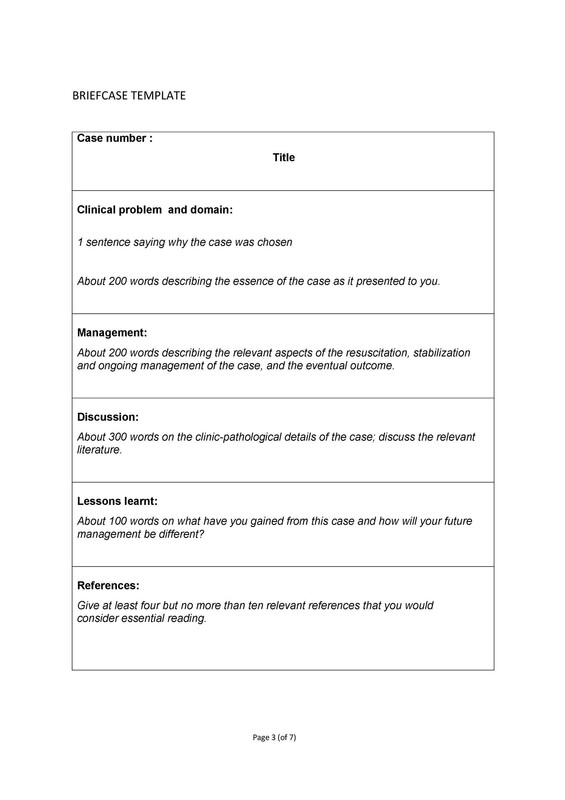 It can also be used to present a case to other people as it is a lot simpler than the actual case file. 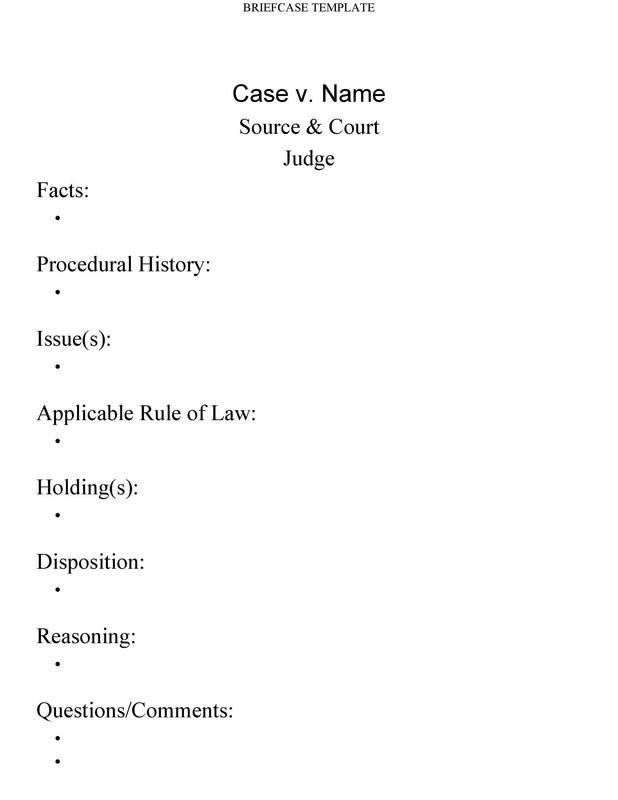 So basically, this document is a reduced and summarized court opinion which would contain all the key elements and would discuss the main point of the court’s opinion. 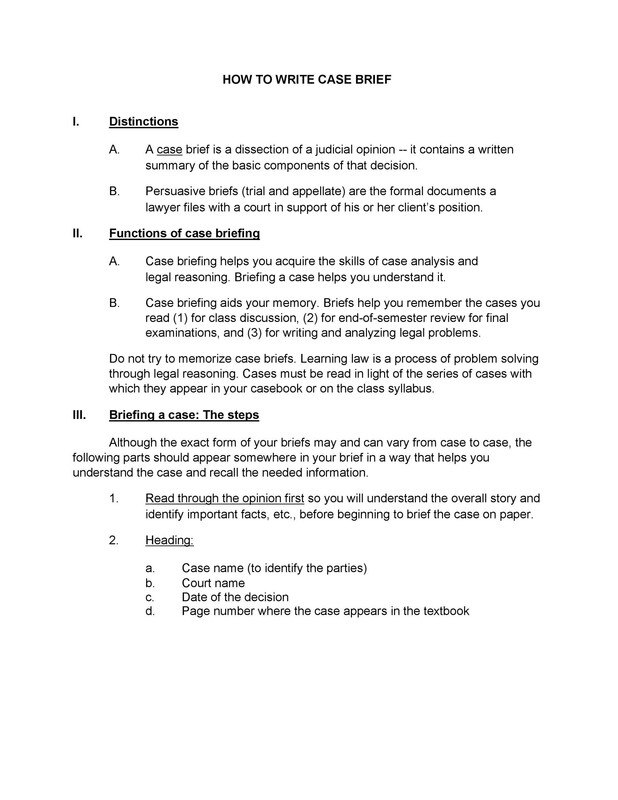 2 What are Case Briefs for? It should be a short summary which is written in your own words. 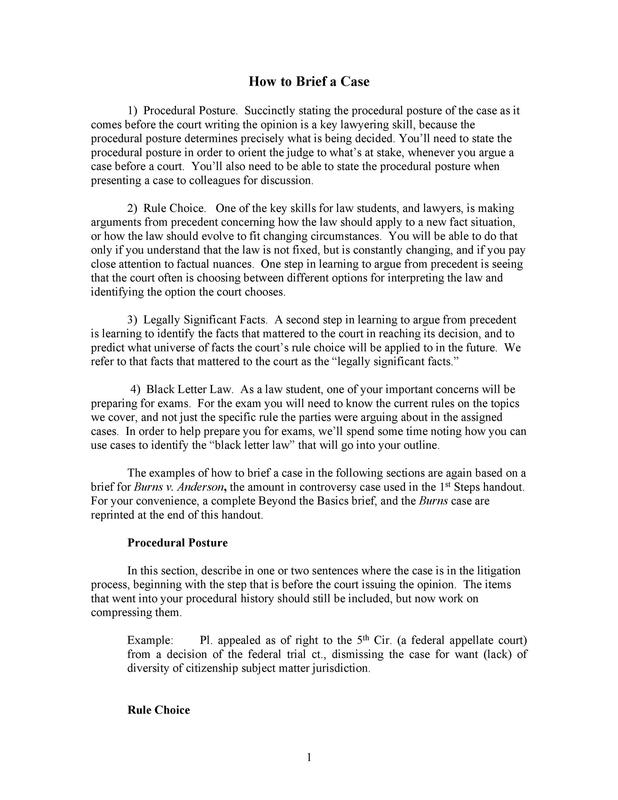 As you are reading a sample case brief or you are learning how to write a case brief, you’d see that it’s basically a paraphrased version of the actual legal document. 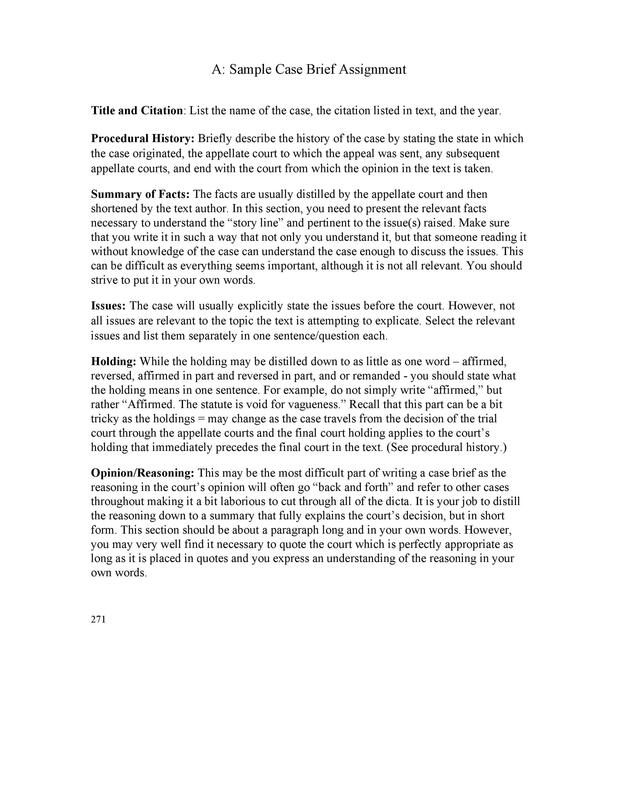 When you are making your own brief, you would be able to understand the case a lot more as you are paraphrasing. This is because you would have to find the key points in the reference document so you would really have to read through it thoroughly. Never attempt to copy from the document verbatim so you won’t end up getting into any trouble. 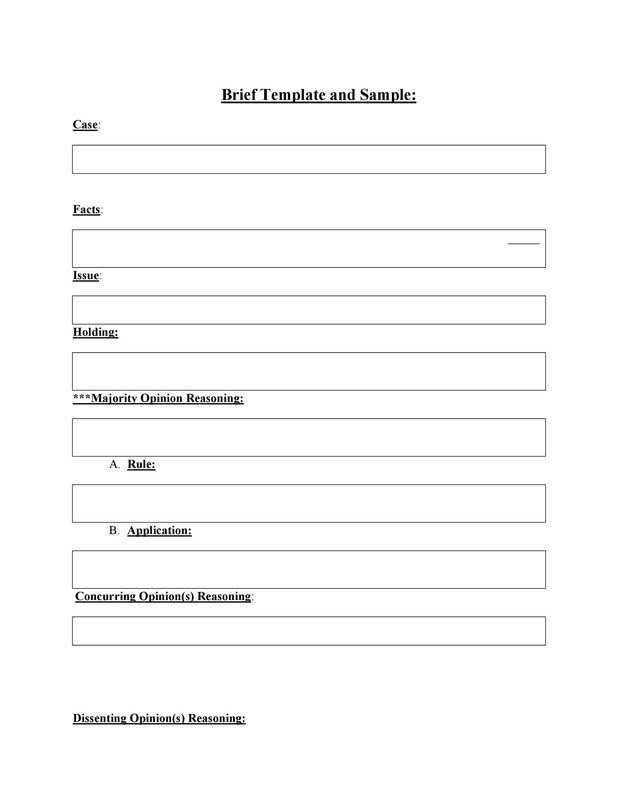 What are Case Briefs for? 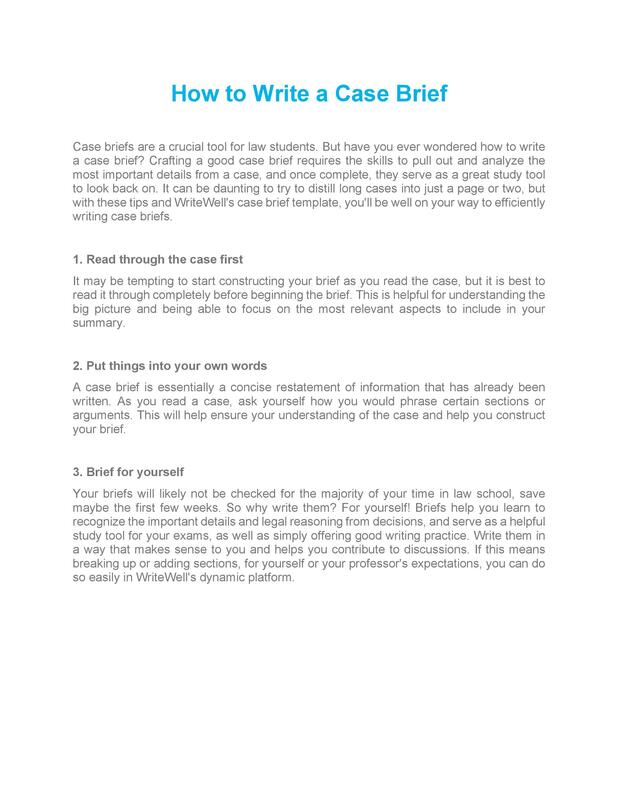 Before you actually learn how to write a case brief, let’s take a look at what they are for. 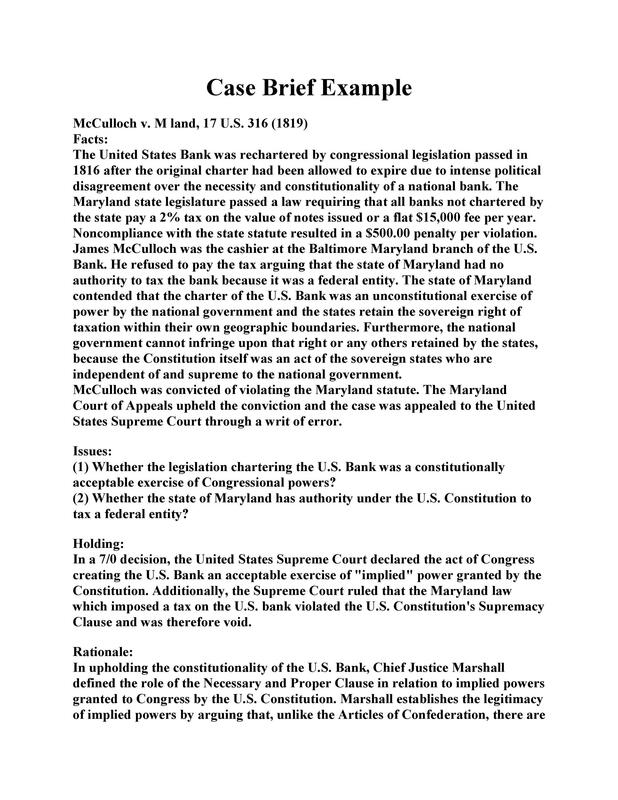 Typically this document is made and used by law students, using their own words. When creating one, make sure to focus on the most important aspects to be able to come up with a complete and comprehensive summary. 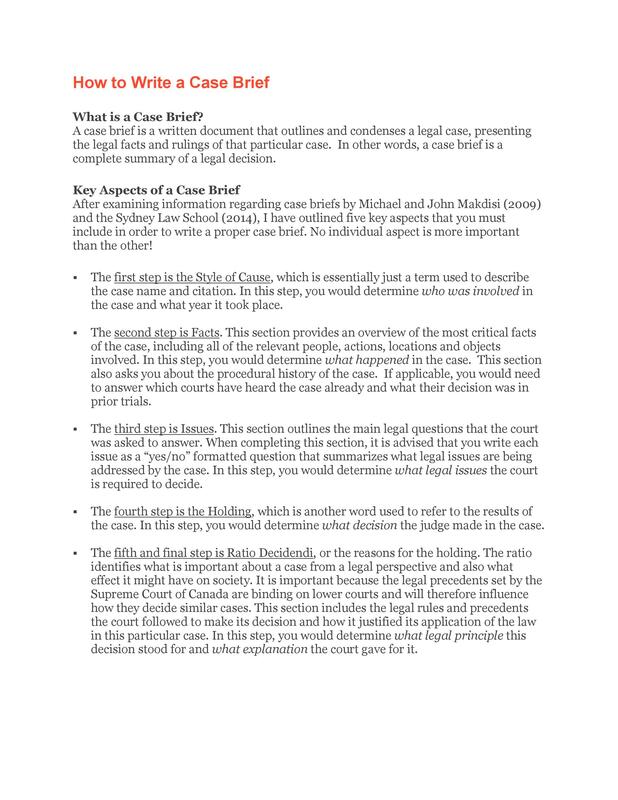 The most basic reason why a law student would create a sample case brief is in preparation for the class. 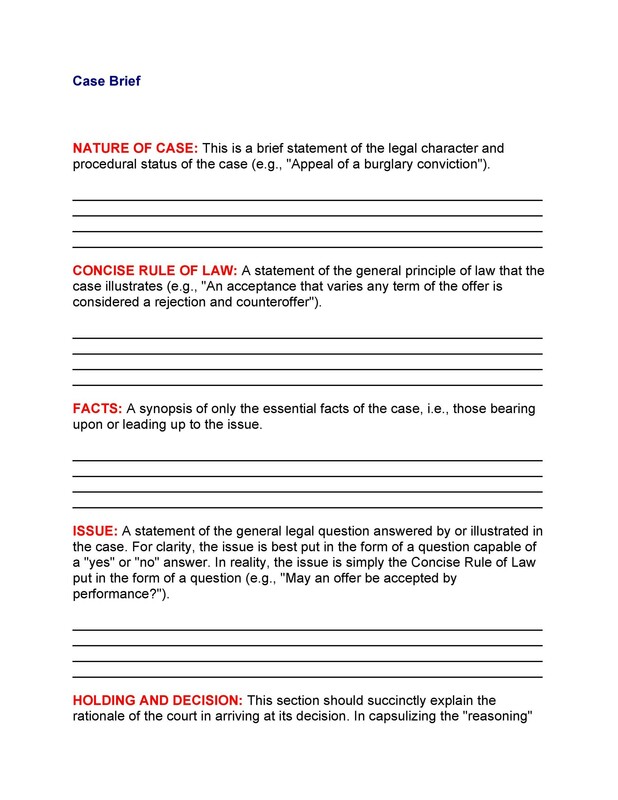 Different cases which are found in textbooks used in law school differ in length so it is essential to pick out all the vital information from the cases and present them in a summarized and organized way. Once done, you would be able to refer to them easily while you are in class. 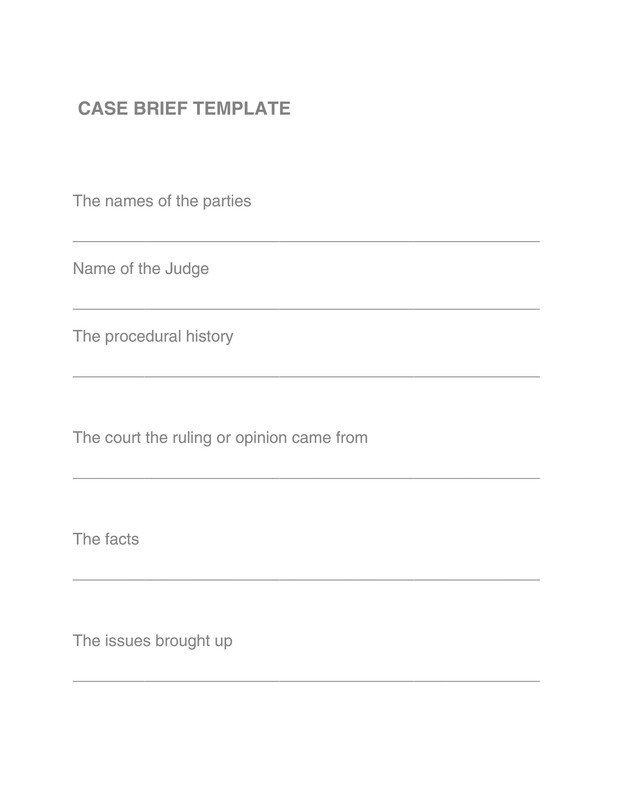 Making a brief would also help you understand and process what you are reading about a case. If your professor happens to call you to answer a question in class, you would already be prepared. 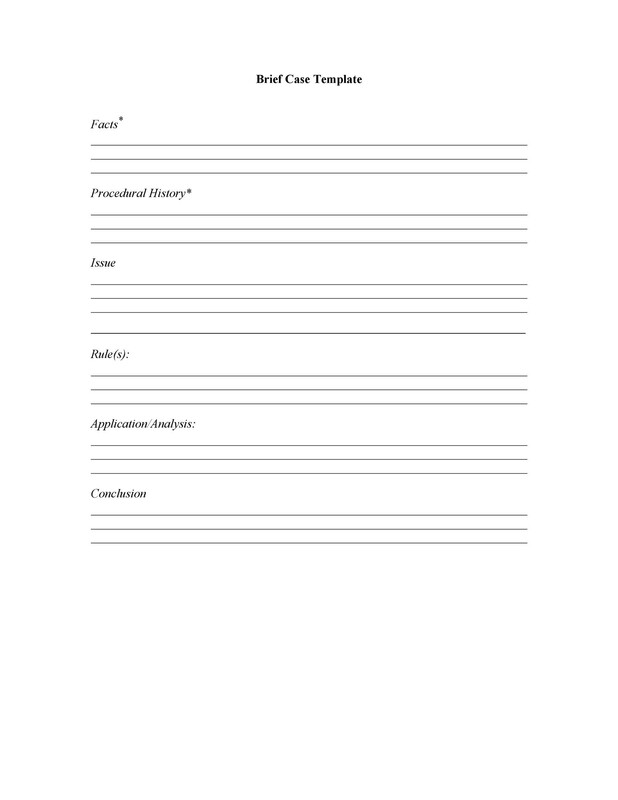 Aside from making use of it in class, you as a student may make a brief in order to get all the key aspects and information for the purposes of legal writing and research. Usually there is a whole course or class focused on this and you’d most likely have a lot of practice making briefs for it. 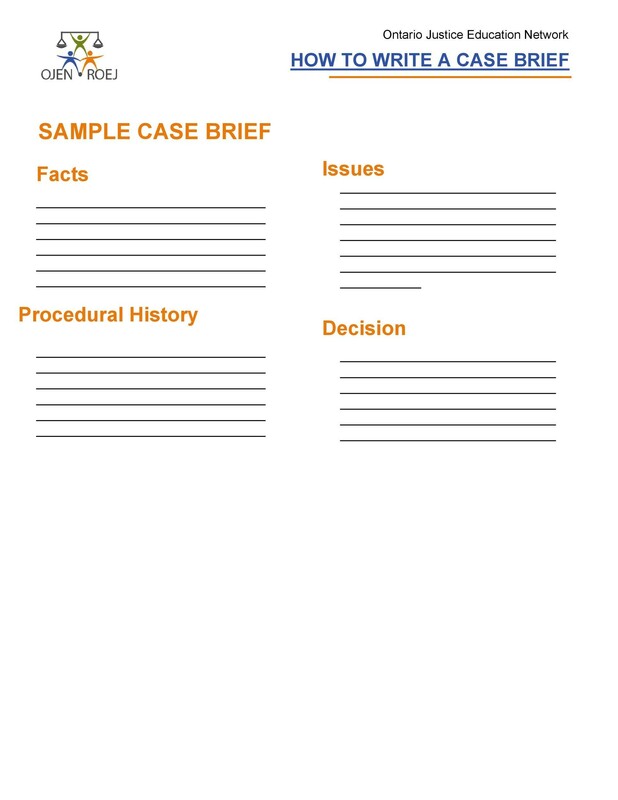 In this context, briefing cases would help you out in identifying the most crucial information for you to be able to complete any legal analysis and arguments. 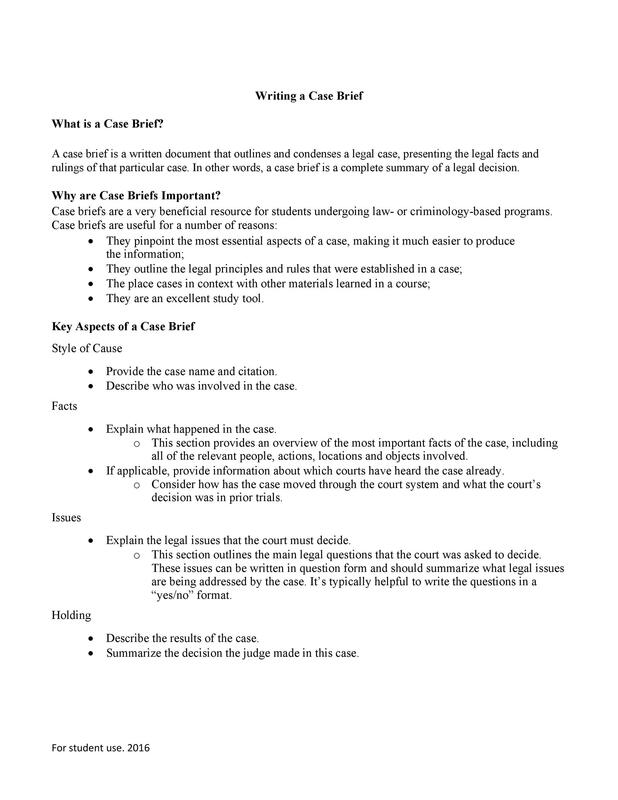 Finally, case briefs are important to build the foundation for further and more advanced studies. 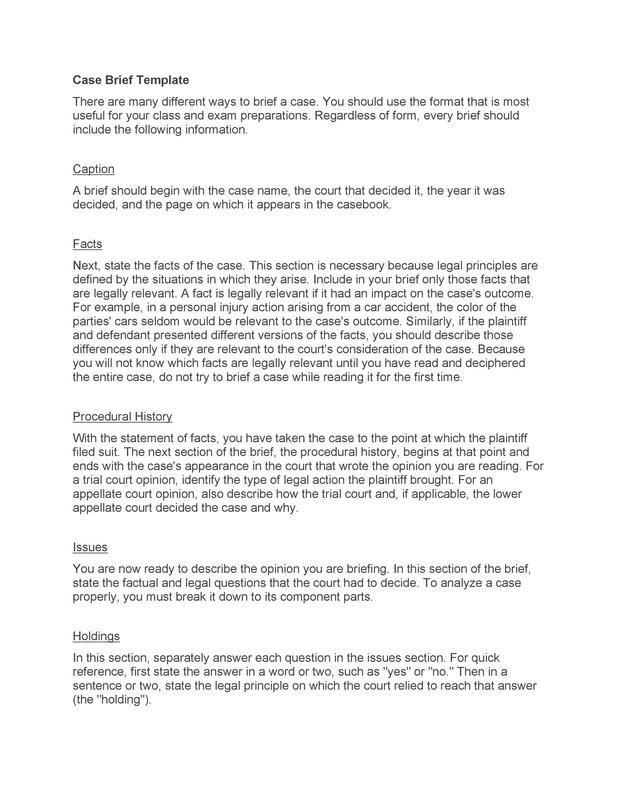 As you are reading through cases and creating briefs, you will be able to integrate all the information then develop a better understanding of all the laws involved in the subject, or the process called outlining. 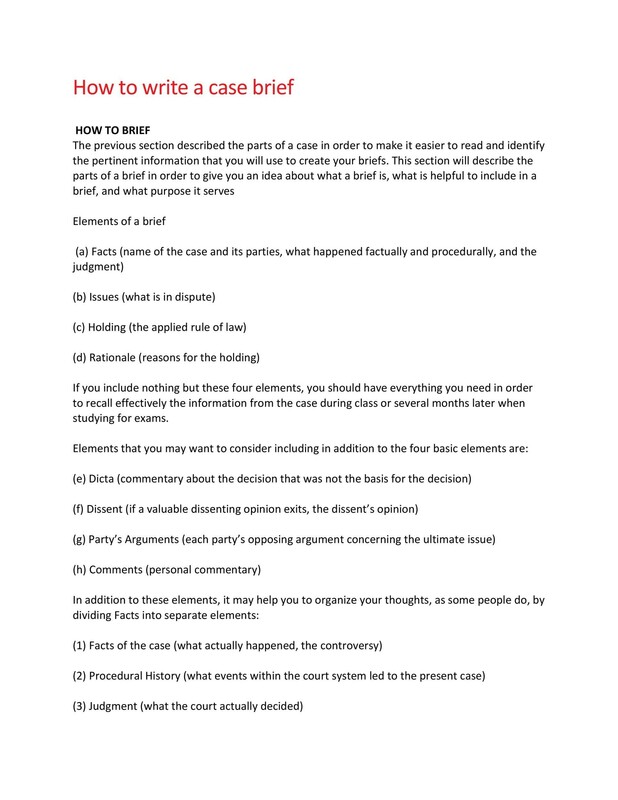 These are the main and most common reasons why law students make briefs. As you can see, they are relevant reasons which move to improve the understanding of cases and other relevant topics. Now let’s take a look at the components of such a document. The very first component would be who are the parties involved in the case. You can identify the parties either by name or by the titles based on their roles in the case. If you’d like your brief to be more specific, you can use both the names and the titles of the parties who are involved. 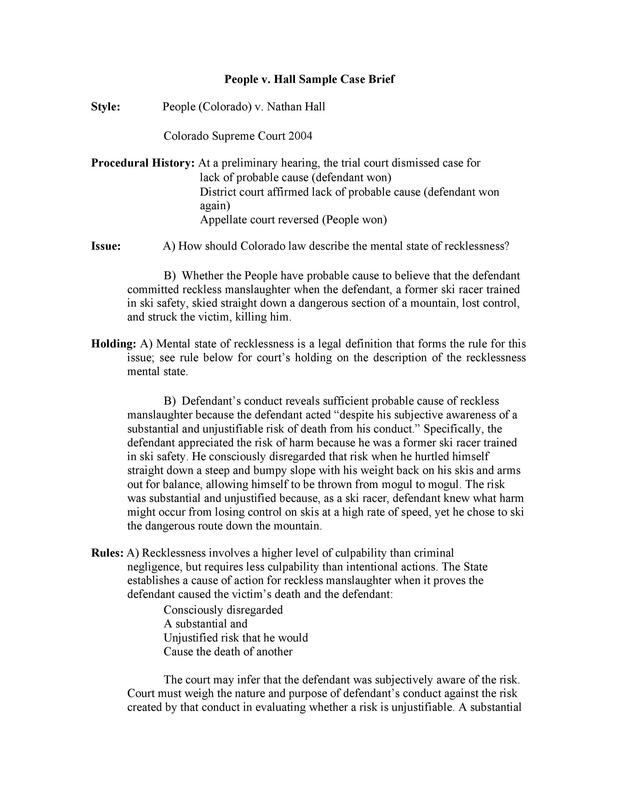 The citation is basically the information which would state where the case was published and it should be included in your brief. 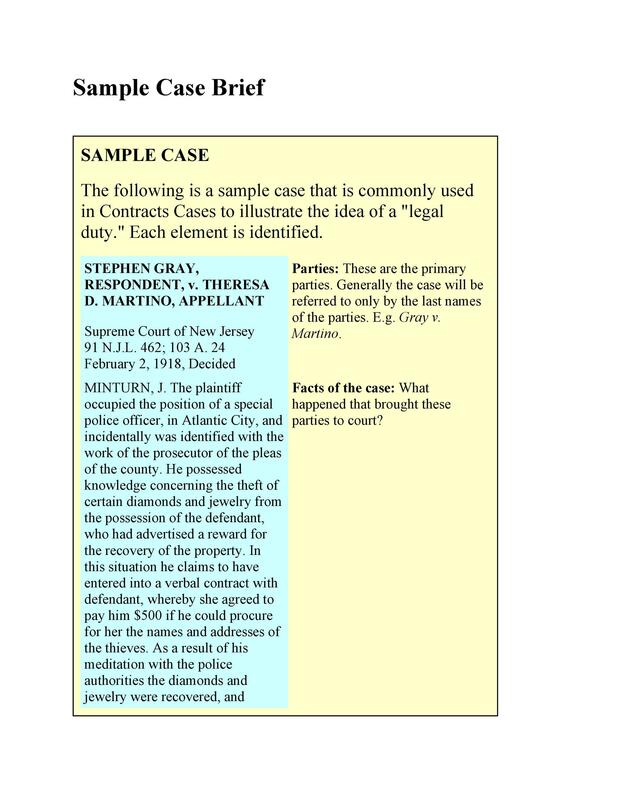 This is added so that the reader/s of your brief would be able to easily find the original file for the case. 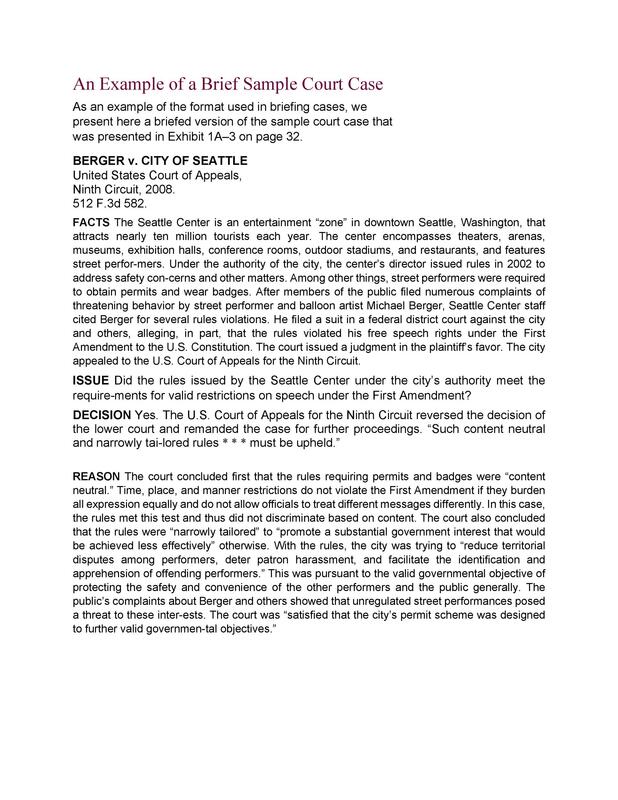 Aside from the citation, you must also include the date the case had been decided. This is important because you may have to trace how legal issues have developed or evolved over time and the dates would help you out. 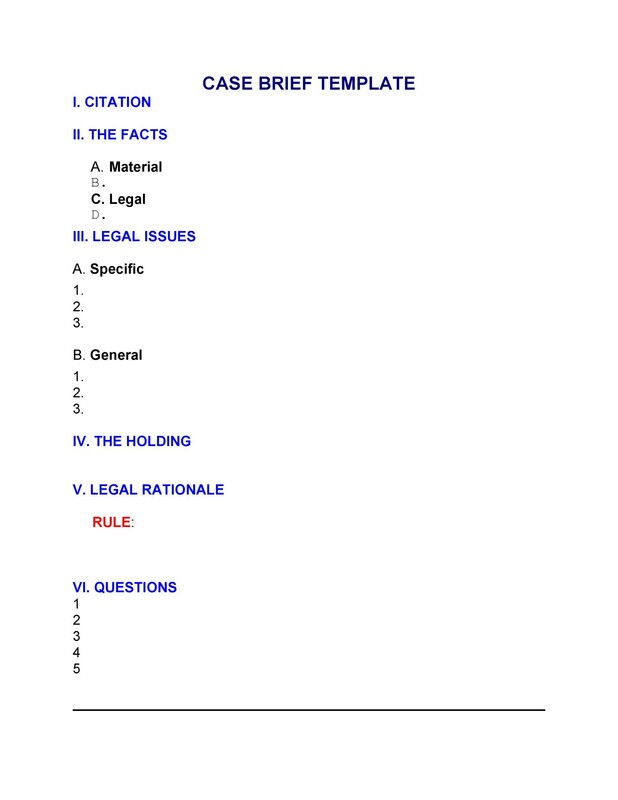 To be able to find the issues easily, you can refer to the table of contents, the section and chapter headings, case introductions and case notes which are usually found after the case itself. Include all the necessary facts and context facts. Necessary facts are those which are legally important while context facts are those which would help you understand the necessary facts. 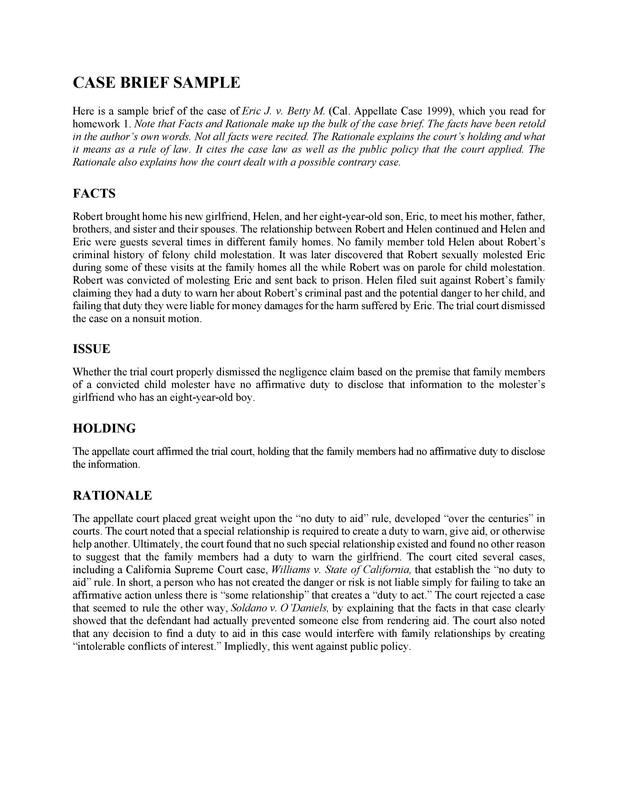 To be able to give a clearer picture of the whole case, both kinds of facts have to be included. This is the most important component of your brief. 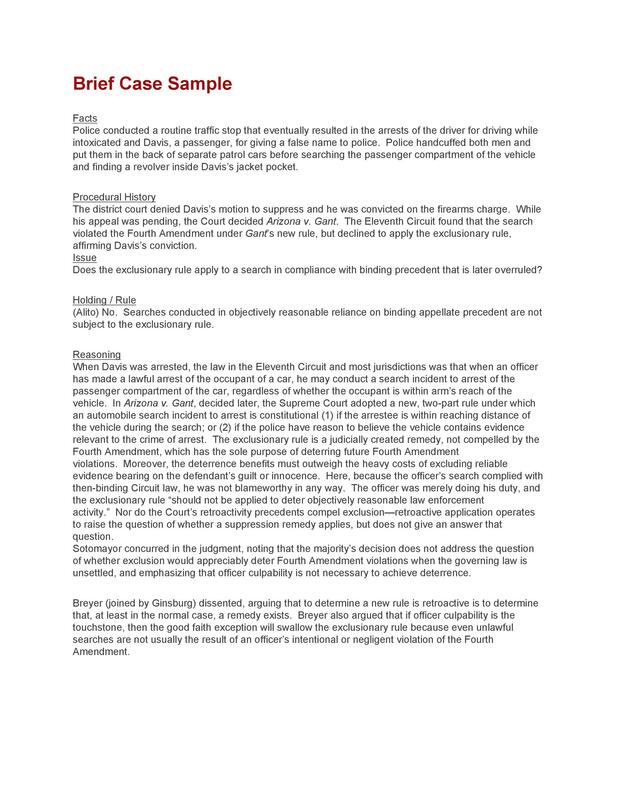 You can establish the reasoning by looking for the locations where the court is applying the law to the different facts. When writing this part, remember to use your own words to get a better understanding of everything you’ve read. Finally, make sure to include the judgment made. This is what the court had done as a result of the holding. 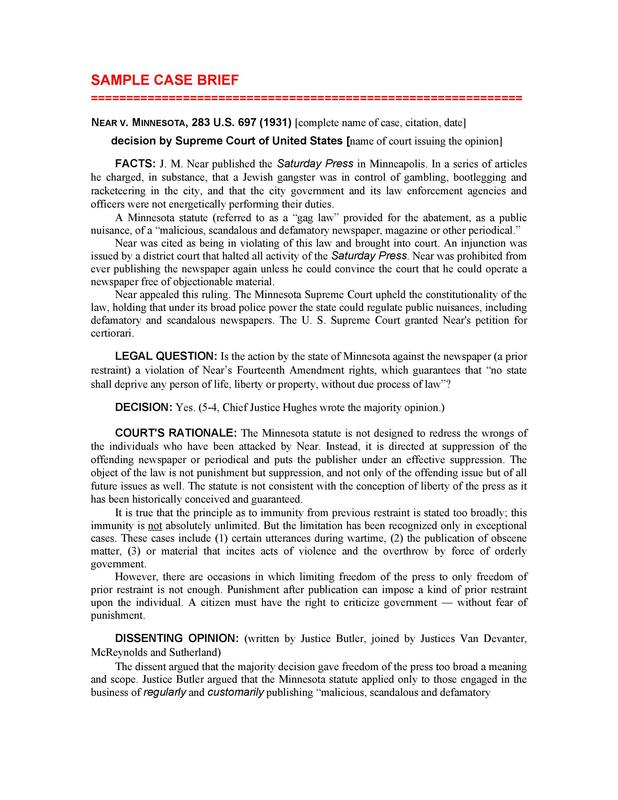 This is how the appellate court managed to resolve the case and it could give directions to the trial court. 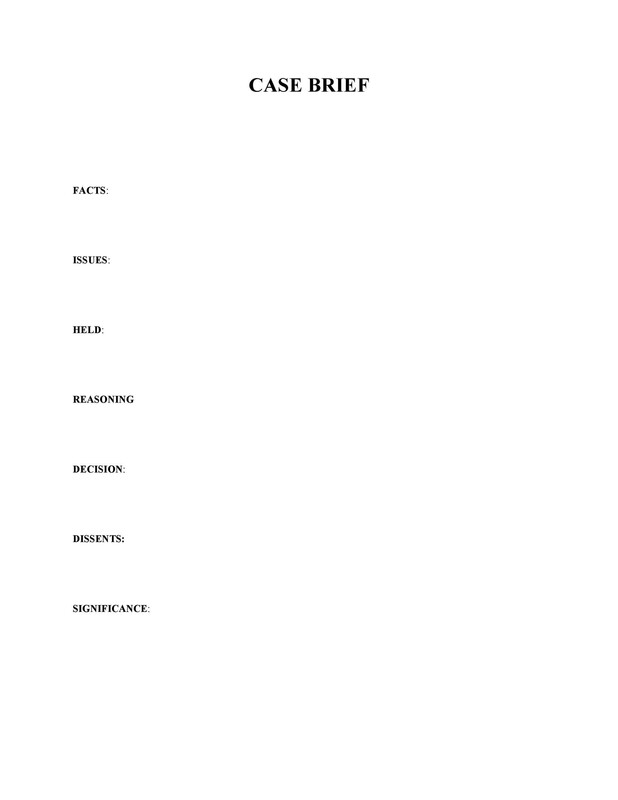 These are the essential components of a brief which should be included if you are planning to make one. 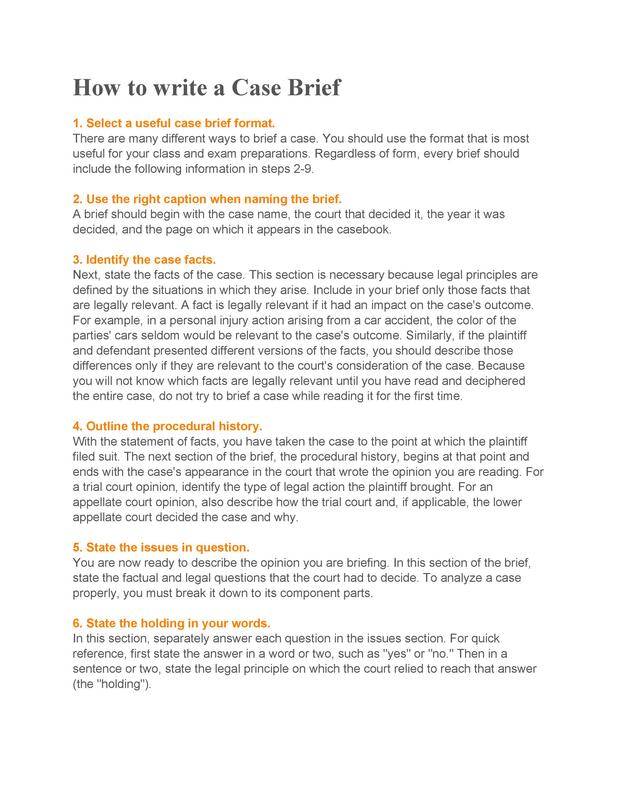 You may have to go through a lot of written material in order to make a brief but by the end of it, one of the main goals is that you’ve already understood the whole case very well. Now let’s move on to discussing reasons for writing such a document. It can help introduce you to different law school reading. Reading and understanding information regarding cases is very different from other kinds of academic reading. You’d have to pay close attention to what you’re reading and understand everything about it. It would help you pick out the “black letter law,” which are the different principles of law which whole opinions are based on. This is important information you would need to know in the long run. It will help you be better prepared for discussions in the class. You’d have a summary of the cases which means you will be holding the most important details regarding the case in your hands. Not only that, you would also have a better understanding of what you’ve read. 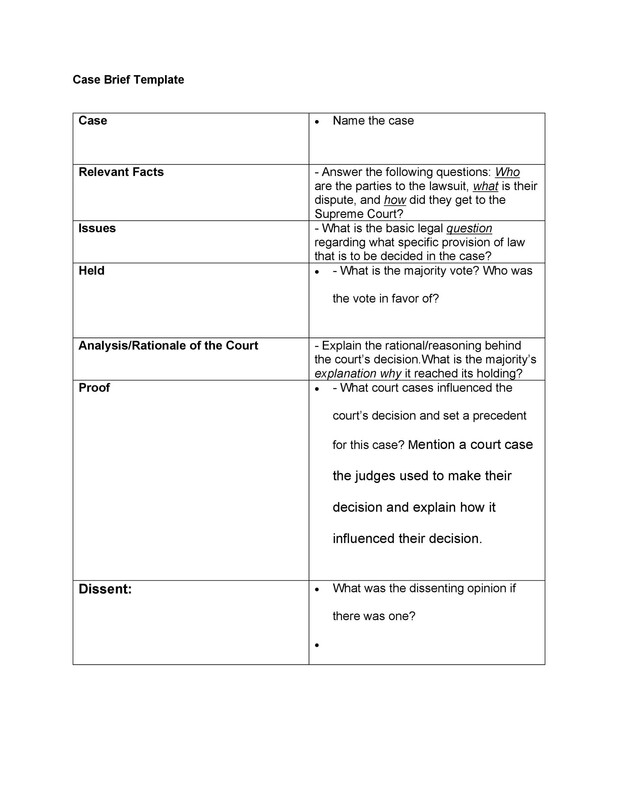 It will help you put the cases in context with other written material you need to study. This means you will be able to apply what you’ve learned as you understand different kinds of cases. It helps makes course outlining a lot easier. When you have different briefs from different cases, you can copy the relevant details to your notes and course outlines as needed. 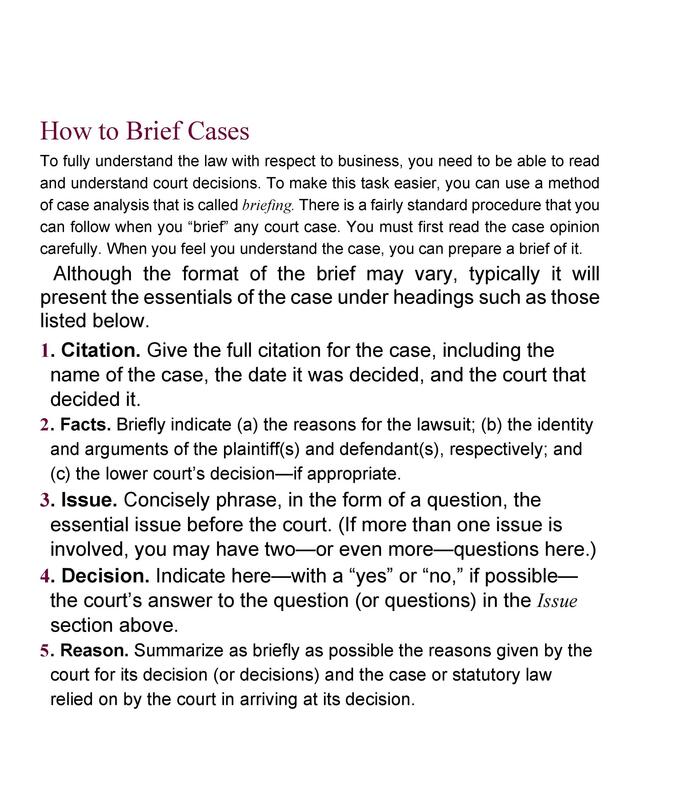 Making a brief is really useful and beneficial especially if you are a law student. It basically aids in your studies and helps you learn a lot better. Now let’s move on to the next section which would actually help you make great case brief examples. 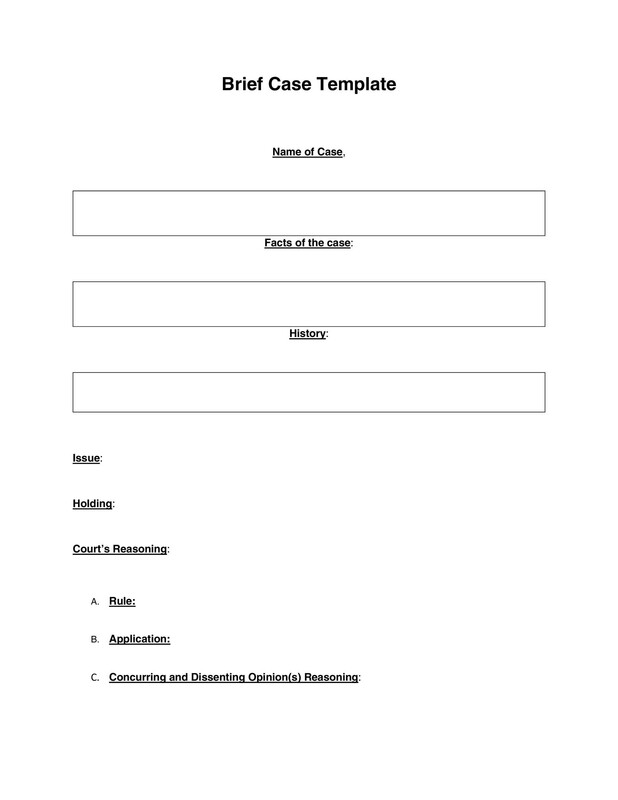 Find all the facts of the case and make an outline of them. The facts are very important as they are the most basic information you would need to make your brief. Make a record of everything that has happened in the cast up until now. Procedures, dates, motions, rulings, verdicts, and judgments, everything. In doing this, you’d gain a better understanding of the whole case. 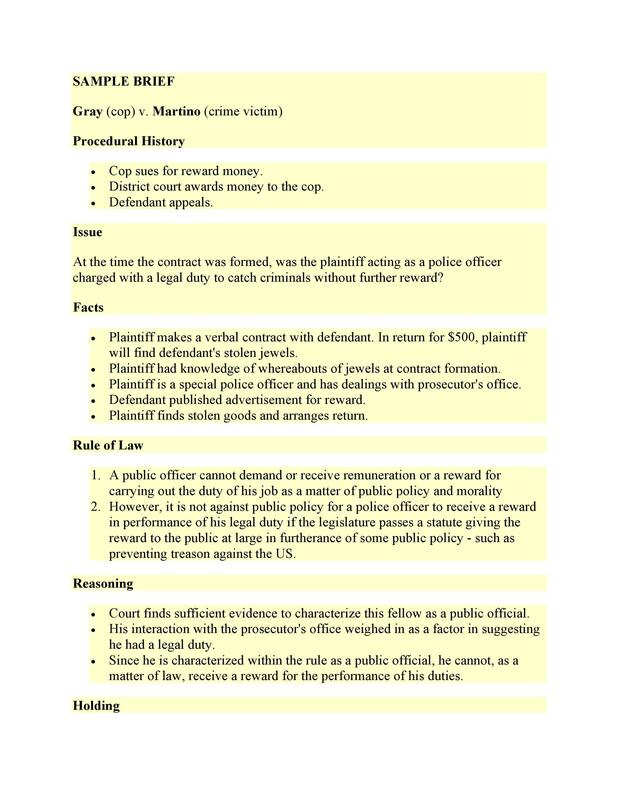 Establish the rule of law or principle of law used in the case. This can also be known as the “black letter law,” which must be a part of your brief. 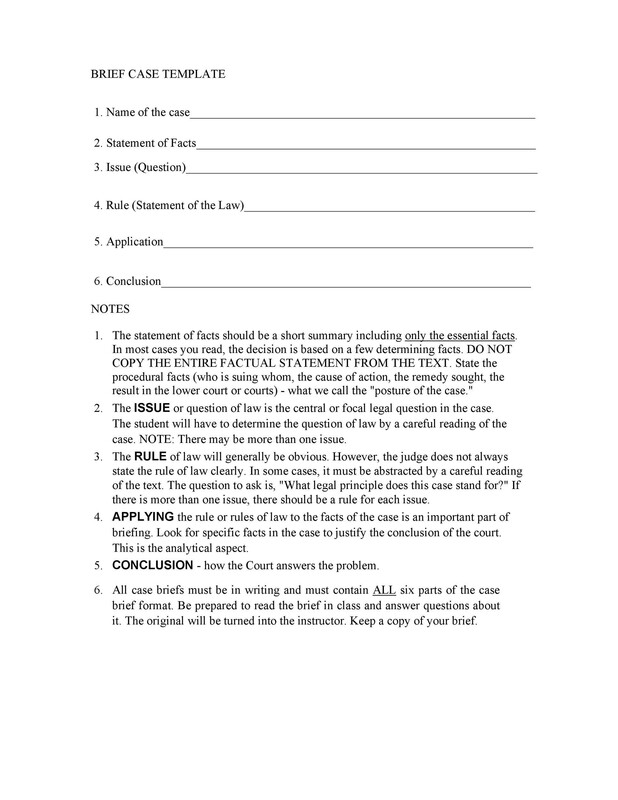 Take time to write the legal reasoning in your brief. This would be a narrative describing why the court had ruled the way it did. It would combine all the parts of the case as well as a step-by-step reasoning of the court. Don’t use up too much time or effort in writing the concurring or dissenting opinion of the judge. You may include it in your brief but you don’t have to place too much emphasis or too many details in writing it. Think about how important the brief is to your class. 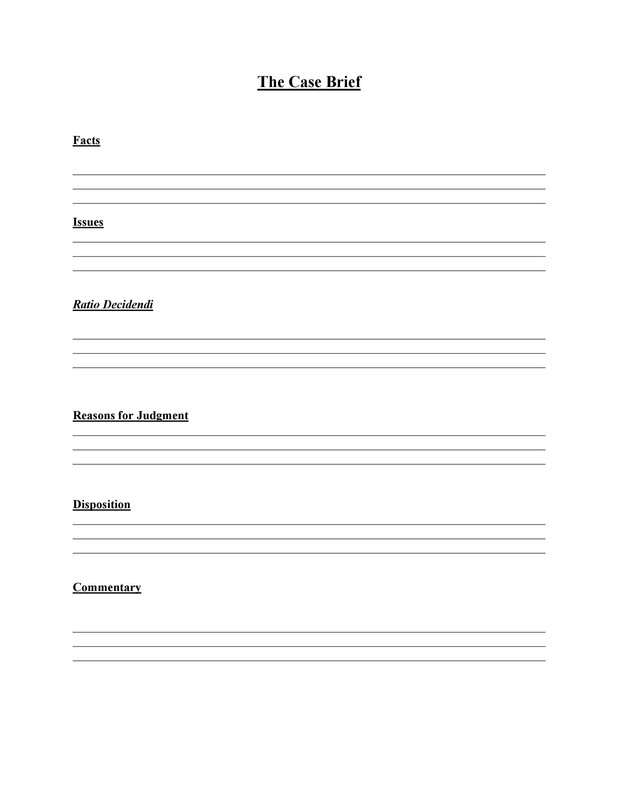 Make notes describing why the brief is relevant to your course or your class and why it was included in your assignment. 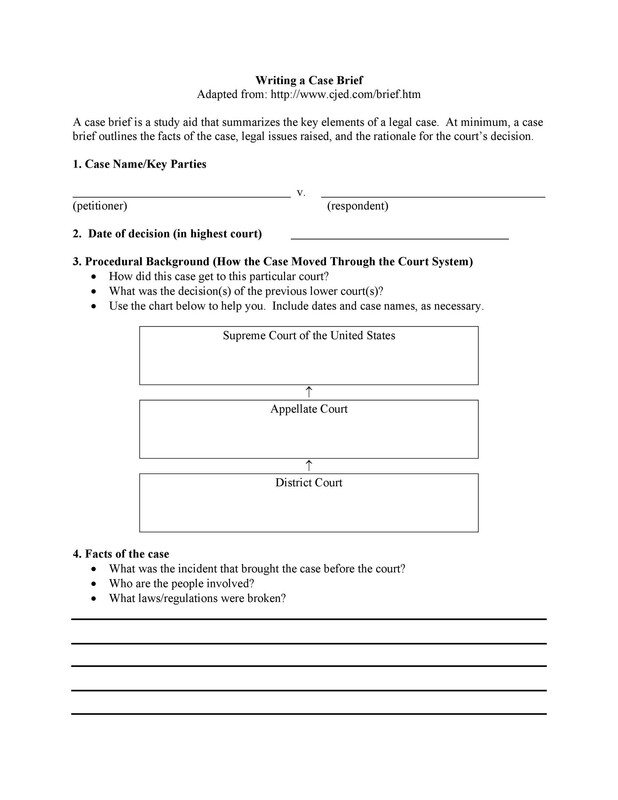 Write down any and all questions you have about the case. This is important so that when you are having discussions in the class, you can raise these questions and get the right answers to them. Making briefs isn’t only a job you must do, it can also serve as a learning experience for you. 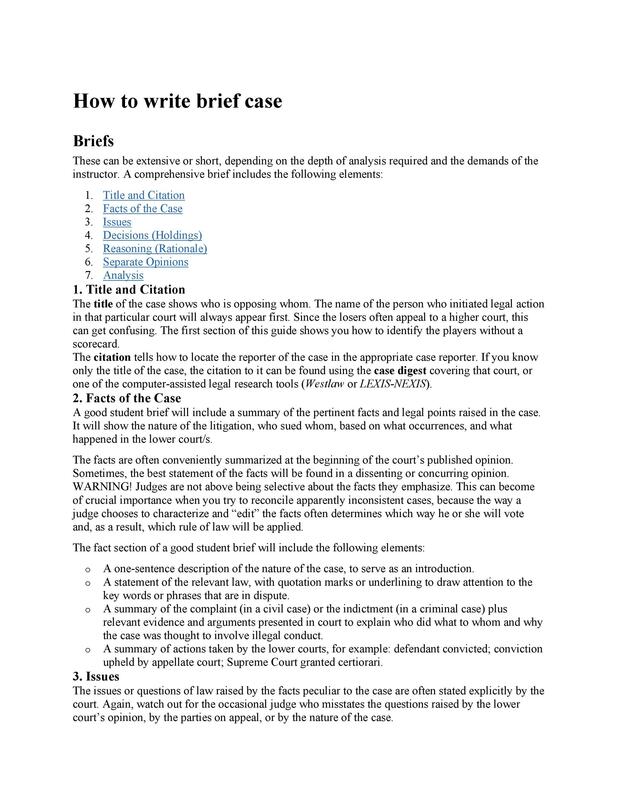 These are tips for law students who are planning to create a brief. Here are more practical and general tips to follow when creating a brief for whatever other reason. Figure out your main argument. 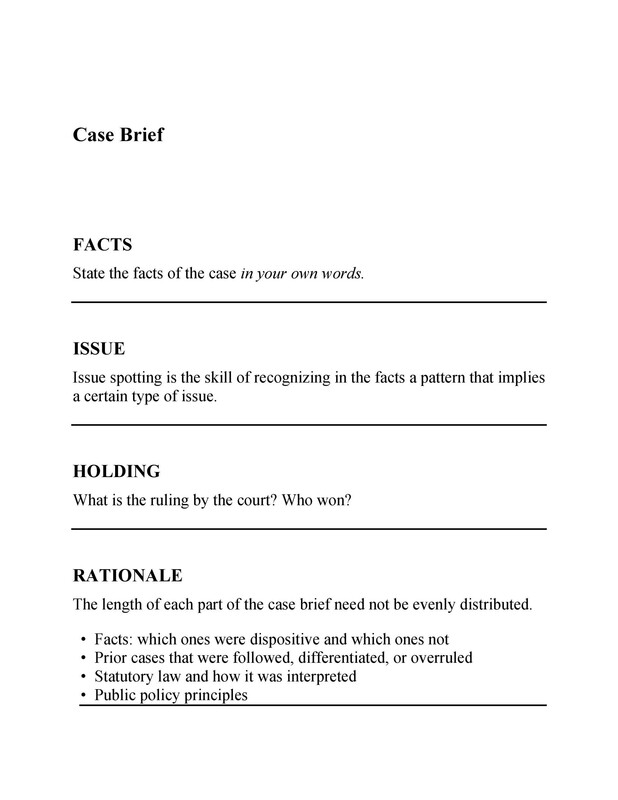 The purpose for writing a brief would be to come up with a summary of the whole case and pick out the most important points of it. As you are doing this, you’d have to analyze each and every aspect of the case for you to be able to figure out your argument. Make sure you know your point and all the defensive strategies you might employ while in court. Make a whole paragraph about your argument and keep on revising it until you’re happy with the result. You wouldn’t want to be caught without a good argument whether in court or in class. Make sure you know all the details and you are familiar with both sides of the case. If you think it would be helpful, come up with different possible arguments. 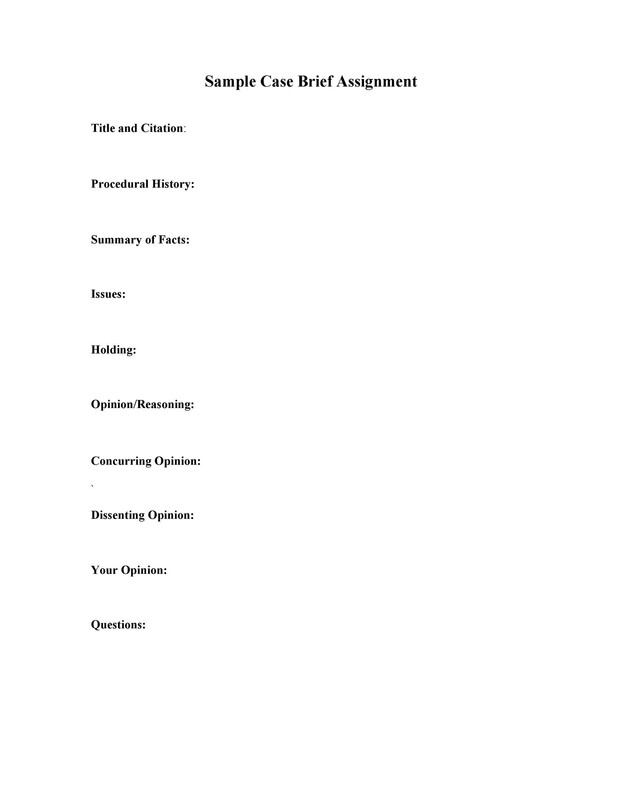 After you’ve done that, pick out only the best arguments and include those in your brief. Remember, your brief should not be very long so only the most relevant and most important parts should be written for your brief to be effective. Tell an interesting and persuasive story. Make sure you focus on telling a clear and conversational story in your brief. It would be better to use an active rather than a passive voice when writing your brief. It would make it a lot easier and more compelling to read. These tips would help you out a lot but you should also think about mistakes you should avoid. Knowing the dos and don’ts of legal writing is essential, especially if you plan to write a lot of documents, letters and other similar texts. Generally, it would be a lot safer to use an active voice over a passive one. It not only avoids confusion but it would emphasize that you are writing the document based on your own experiences and using your own words. It also creates a stronger impact on legal documents overall. An ambiguous pronoun happens when the pronoun may refer to more than one person in the same sentence. When you use such pronouns, the readers may get confused as to who you are actually referring to. When using pronouns, make sure they only refer to one person as to avoid confusion or misinterpretation. 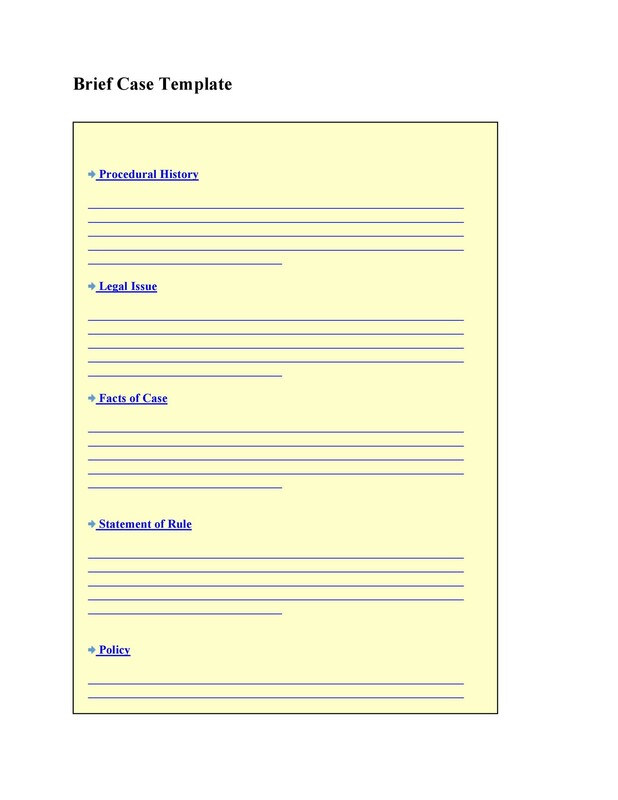 In writing certain documents, like a case brief, you would have to avoid writing everything down. You may be thinking that you don’t want to miss out on anything but actually, the lengthy content is unnecessary. Also, when the content is too long, readers are put off by it and would end up just skimming through the document, which renders your document almost useless. So remember, include all the relevant information but present it briefly and directly. It’s quite a common mistake in legal writing when verbs and nouns are interchanged. This is referred to as nominalization, when a verb is used as a noun, which is incorrect and often unnecessary. You can improve your writing a great deal by avoiding nominalizations whenever you can. Legalese is basically any technical jargon used in legal writing. Actually, in any kind of writing, when technical jargon is used too much, it makes the text very difficult to understand. You may either want to sound smart or you may want to use such terms to make the document “more legal,” but actually it doesn’t. When appropriate, it’s okay to use such jargon but when overused, it becomes ineffective and redundant. Proofreading is a very important final step in making any kind of document, even a case brief. When you are writing or working on a particular document for a long time, you may tend to ignore or overlook common mistakes in spelling and grammar. A good practice would be to proofread your work as soon as you’re done. You can also ask someone else to proofread your work to check if you had missed any mistakes.